A pulpotomy is when the inflamed pulp chamber, usually on a baby molar, is removed, the area is sterilized and the chamber is sealed. This procedure can be done in some cases on permanent teeth and is considered the first half of a root canal. It is a very common procedure in children and has a reasonably good prognosis of success. It’s also fairly easy to do in conjunction with associated procedures. When a cavity gets really deep, close to the pulp of a tooth or even into the pulp, the pulpal tissue becomes irritated and inflamed. This is usually the “tooth ache” you feel. 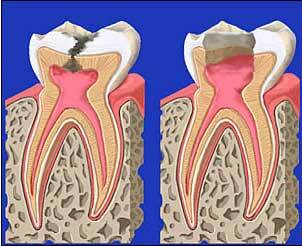 If the inflammation and infection continues without treatment, the tooth will likely eventually abscess. In baby molars, a pulpotomy is used in the process of trying to save and restore the tooth. Step 1: Decay has extended to the pulp (the live portion) of the child’s tooth. 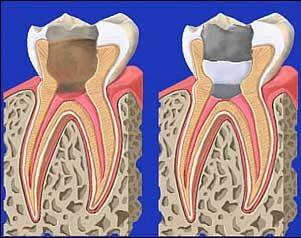 Access to the pulp is created through the top of the tooth. Step 2: The coronal portion of the pulp is removed and disinfected. A soothing medicament is placed to help prevent further infection. A restoration is placed to seal off the access.